Around 1300, William grandson of Houlet of ‘Mancestre’ granted to Jordan, son of William of Fallafeld a portion of lands in Rusholme ,three acres to be held by Jordan and his heirs on payment of three pence annually at the feast of nativity of our Lord and at the feast of St. John the Baptist. 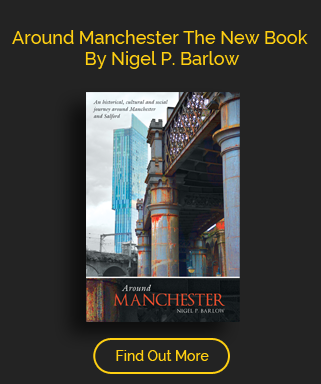 “In walking through the village,or along the Wilbraham Road, one often tries to picture how things would have looked 600 years ago the time when Fallowfield is first mentioned. Mrs W.C Williamson Sketches of Fallowfield and the Surrounding Manors Past and Present in 1888. In 1655 we know that the ratepayers were nine in number and that in 1774 there were fifteen houses. Four residences were erected between this date and 1818 Fallowfield Lodge, Oak farm, Ashfield and Mabfield. By the 1820’s a pretty village had developed, entered by a picturesque bridge over a trout stream – white cottages had gone up along Old Hall Lane with each of the gardens containing a pig sty and tall Poplar trees. Along the present Sherwood St were hand loomed cottages, the women carrying their produce to Manchester on foot on Market days. The Holy Innocent’s Church opened in 1872 on the Wilmslow Road, the railway came in 1891 part of the Fallowfield loop line, so called because it linked the MIdland South line from Chorlton with Fairfield Station. As with other parts of South Manchester, the largely unspoilt Fallowfield attracted some of Manchester’s more prosperous. Alfred Waterhouse designed Barcombe Cottage for his own residence and others included the Firs family, the Behrens and Joseph Whitworth. The Manchester Athletic Club ground opened in 1891 and two years later would host the FA Cup final between Wolverhampton Wanderers and Everton but having a capacity of 15,000, the attendance of 45,000 meant the majority of spectators had no view of the match. In addition, the stadium also hosted the 1899 FA Cup semi-final between Sheffield United and Liverpool but the match had to be abandoned due to a crush in the crowd. Manchester Grammar School relocated to the village; part of Manchester since 1905, and in the 1920’s the University began to use the area for halls of residence. Today Fallowfield is predominantly a student area with the University of Manchester’s Owen’s Park complex dominating.